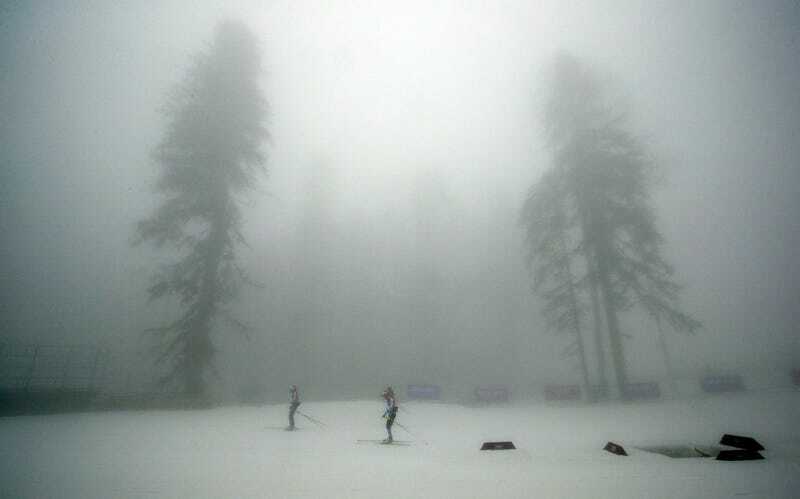 Heavy fog in the mountains above Sochi caused postponements of men's biathlon and snowboard cross races today. Visibilities were near zero at times, making the shooting portion of biathlon impossible, and snowboarding downright dangerous. But let no one say organizers didn't try everything in their power to get the events underway: They attempted to blow the fog away with giant fans. Blowing in God's face did not work, surprisingly enough. Both events were pushed back to tomorrow. At the very least, we were able to salvage some cool photos of the fogged-out games.